It's been almost two months since my last post. During that time spring migration has largely come and gone. We witnessed it in three states: Illinois, Virginia and here at home in Pennsylvania. But during that great time of the year it always seems far more important to be out as spring and bird migration occur, in the midst of it all, rather than typing away at a computer screen. And of course that's the great irony of nature-related blogs: they may often be used in praise of nature but all the while that they're being created and read is time away from nature. A beautiful photo of a Blackburnian Warbler or piled up clouds on the Blue Ridges of Virginia will never begin to equal actually being out and seeing both the warbler and the clouds. My last post included a sketch of a Palm Warbler seen while walking along the Wissahickon and trying to figure out what to do for my next painting. Palms are always some of the very earliest warblers of spring migration in the eastern U.S. They're rich golden yellow wash is always a pleasant change from the grays of winter. I wasn't surprised to see them in Philadelphia in early April but I didn't expect to find them in Illinois in early May. I envisioned some of the later warblers that would normally be seen in Philadelphia in early May, not to mention other neo-Tropical migrants like Baltimore Orioles. However my first day birding in Illinois, at the Oakdale Nature Preserve in Freeport, Illinois was a drizzly day in the 40s. In that weather Palm Warblers seemed right. I was just hoping for 70s and Black-Throated Greens! I took many photos of cooperative Palm Warblers while in Illinois. On one day I wanted to surprise my wife, who was busy with family matters, with a watercolor based on the birds seen that day. So about 4:30 p.m. I went to a photo-processing kiosk at a local drug store and made my first attempt at editing/ordering photos straight off a memory card. Usually I do this at home with my own photo-editing software. The process was a bit clunky but nonetheless I walked out of the store 30 minutes later with a number of photos. They in turn became the source of the small watercolor at top of this post. I finished it before 7 p.m. I imagine there are no awards for speed painting and I wouldn't be interested if there were. Good art is rarely done speedily. But I did have to marvel at the speed of the entire process! Other high birding points of the Illinois trip included a very cooperative Red-headed Woodpecker and a Yellow-throated Vireo that stayed about 6 feet off the ground on bare branches rather than 30 feet off the ground buried in vegetation. I saw both of these at Lake Le-Aqua-Na State Park. We don't often see either of these birds so it was great to see both within 25 feet of one another. One other interesting birding sight: a flock of White Pelicans flying down the Rock River near Castle Rock State Park. Some birds, for example Sandhill Cranes, Great Blue Herons, and White Pelicans, always stop me in my tracks when I see them in flight. There is always something both primordial and magisterial in the image they present. Speaking of interesting birding sights I also can't forget the 8-10 Sandhill Cranes seen at Chain O' Lakes State Park or the four that landed in front of us as we approached Monroe, Wisconsin. I'd forgotten that we'd seen any notable birds in our brief time in Wisconsin, but the sight of them appearing out of the sky in front of us and landing in the mud of a local farm was enough to make me slam on the brakes and pull off to the side of the road to take a look. I don't think we've ever gotten such a close look at them. The last post included a pen and ink drawing that was to be the basis of the "abandoned painting," the one I couldn't decide what to do with. In mid-April I finished it. The image above is a small version of it. A larger image is at my main web site. I'm happy with it. I wasn't really sure what to do with this painting. There was a temptation to do a flattened painting where one or more Canada Warblers would be pinned to the flat space of a painting by the various verticals of the stems of the shrubs in which they sat. That would have worked but that type of painting can give precedence to design over subject matter. I've done plenty of that but I didn't want to to it here. 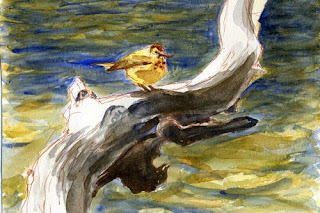 I also didn't want to do a vignette, so common in bird paintings. The end result is this multiple vignette. I'm not sure why I chose this but it was an interesting experiment. 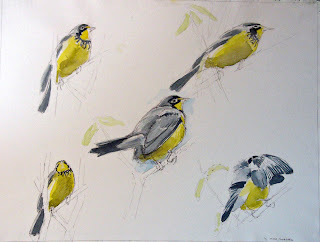 That catches me up somewhat on older birding and art activities. I hope the next post will include some new art.